Marian Hossa had a long time to think about this. He finished last year stuck on 499 goals, and if he didn’t spend the entire offseason imagining the precise circumstances of his milestone goal, he knew he wanted a goalie to be involved. “I definitely didn’t want to [score] 500 into an empty net,” Hossa said. Number 500 was a pretty typical Hossa goal, powering his way around a defenseman and backhanding the puck home past Michal Neuvirth. 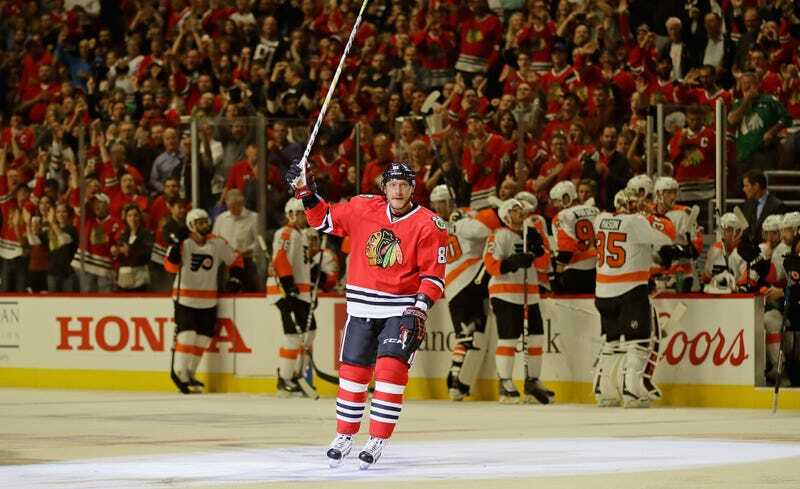 Despite the score at the time, Hossa’s tally very much mattered as Chicago squandered its 4-0 lead before surging again to beat the Flyers 7-4. With the goal, the 37-year-old Slovak became just the 44th player in NHL history to reach the 500-goal mark. He’s fourth among active players, behind only Jaromir Jagr (749), Jarome Iginla (612), and Alexander Ovechkin (526).